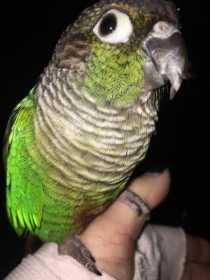 My Green Cheek Conure flew off my pet sitter’s shoulder out the garage of our home. She has a grey head with green cheeks, grey and red breast, green wings and body, blue feathers under her wings and a red tail. She is very friendly.